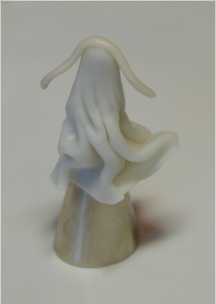 also use transparent fimo or sculpey. display in your a miniature scene. the top of a miniature tree. 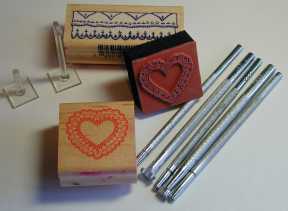 For this you can use buttons, leather working tools, rubber stamps in designs as shown below. I have even pressed old earrings with a relief design into the cernit. Work with very clean hands. I like to use hand wipes, they are also very good for cleaning your tools as well or you can use baby oil. I always like to clean the pasta machine with baby oil before using it. It also stops the cernit from sticking. 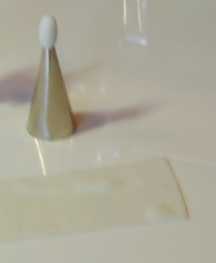 Take a small roll 1/4" and press it on the top of the metal decorating tip. Roll a ball 3/4" through the pasta machine at medium setting and keep putting the roll through the pasta machine until it is fairly thin but not as thin as Delphine's gown. For Serephine I actually pressed a heart stamp with a design around the edge shown above into the rolled out cernit and then cut out the heart and draped the heart shaped piece around the body for the gown. 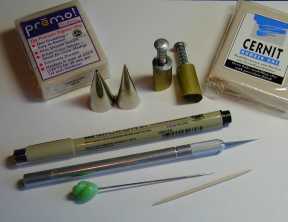 Or with the rolled out cernit on a piece of wax paper, press a design into it with a rubber stamp, leather working tools or any other relief tool. Cut a rectangle from this piece of rolled out, designed white cernit 3 1/2"X 1"
Drap the gown as shown in the photo below gathering as you go around the tip and after pressing the top of the gown together to make the waist thinner. Roll out a thin roll of flesh for the arms and put on top of the body, add a small piece of flesh for the front of the chest area. Cut a square out of the cernit and press a design into that piece. Cut a small square out of the center of this piece which will be the yoke and drape it over the arms put so it comes to a point in the front and covers the arms. Cut a couple of narrow strips and shape onto the gown into a bow with ribbons. Roll a tiny ball and apply to the top of the body for the neck. Roll out another ball shape about 3/8" and apply to the top of the neck for the head. Press a tooth pick in for the two eyes and a small indentation for the mouth. Roll out a hair colour about the same thickness as the gown. Cut in narrow strips and wrap around a pin into curls and apply to the head. Shaping and adding more until it covers. Roll out more of the white cernit for the wings. For Serephine I pressed a butterfly rubber stamp into the rolled out cernit then cut it out with an Xacto knife and applied it to the angels back. Before it is baked add highlights with iridescent metallic powder from Faber. Bake it in a toaster oven or oven set at 265 degrees for 10 min. I know other people say to bake it longer but this is really thin cernit and cooked too long will change the colour from white to cream. Immediately submerge the angel still on the metal decorating tip in ice water when you take it out of the oven as it will help strengthen your angel. 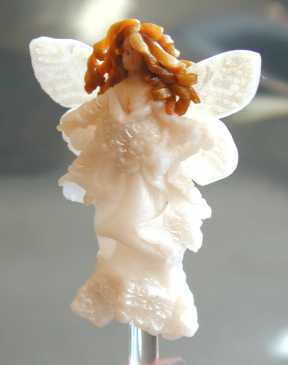 Now you can remove the metal decorating tip and put your angel on a plastic stand or hang it. Darken the eyes with a light touch of a permanent marker, I prefer a fine Pentel marker or use paints. I made the plastic stand by cutting off a plastic hook from a plastic shop that are used for hanging products. If you do this project and are pleased with it and have any photos to share I would love to see them and perhaps I could create a photo page of angels.